Catastrophe A Highland Murder Most Fowl. 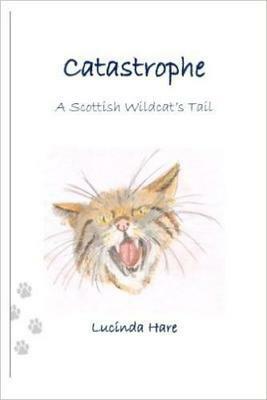 Who needs gritty, dark psychological thriller when you can curl up in your armchair with your furry companions and read a cosy murder mystery especially one where a feisty Scottish wildcat pits his superior feline wits against a delightfully wicked murderer in the rugged heart of the Scottish Highlands? A wildcat moves softly through his Highland world describing it through feline eyes in exquisite golden detail. Scent is a language of its own. His is an elemental world of rain and snow, of forest, moorland and mountain. A world of changing seasons and the endless dance of life and death; predator and prey. Although the wildcat's home is a world of poetic beauty it is also one of sudden terrifying violence where the ultimate predator is mankind. Shot deliberately by a gamekeeper on a shooting estate the wildcat nearly dies before being rescued by a young couple. After a spell in the vets he convalesces in their Perthshire cottage where he learns to love their old bony cat, Haggis, and author Mary, The hunting moon is barely on the rise when bad news arrives from the solicitors. Mary's beloved Aunt Edith suddenly dies and the couple head north into the Highlands with Catastrophe. Arriving at Driechandubh Castle, where Mary was raised by Aunt Edith, they barely escape with their lives as a large chunk of masonry 'accidentally' falls in a storm. Things don't improve as they meet odious Aunt Maud, Edith's envious sister who has ensconced herself in the castle like a cuckoo, under the pretext of nursing Edith. As an apex predator Catastrophe instinctively sees through Maud's charade as grieving sister: he can smell her underlying fear and hostility at her niece's unexpected arrival and hear the falsehood in her voice. Aunt Maud is hiding a terrible secret. Aunt Maud mistakenly sees Catastrophe merely as a fashion accessory. Divided by mutual loathing Catastrophe finds himself drawn into a web of intrigue, murder and adventure that will test our magnificent wildcat sleuth to his limits. Can Catastrophe unravel odious Aunt Maud's dastardly plans before it's too late?